Not so long ago, it became known that some laptop manufacturers are preparing new mobile gaming systems that combine AMD Ryzen generation Picasso processors and Turing based graphics accelerators. And now the well-known source of leaks with the pseudonym TumApisak shared a screenshot from the 3DMark test that confirms the existence of such laptops. 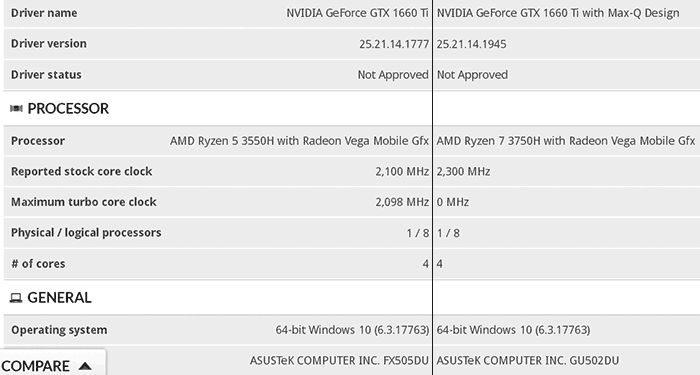 The screenshot shows the characteristics of the ASUS TUF Gaming FX505DU and ROG GU502DU laptops. Both laptops are built on the latest AMD 3000 Series mobile hybrid processors: Ryzen 5 3550H and Ryzen 7 3750H, respectively. These chips each include four Zen + cores that are capable of operating on eight threads. The third-level cache is 6 MB, and the TDP level does not exceed 35 watts. The Ryzen 5 3550H processor operates at 2.1 / 3.7 GHz, while the older Ryzen 7 3750H features 2.3 / 4.0 GHz. Both laptops are equipped with a discrete graphics card NVIDIA GeForce GTX 1660 Ti. 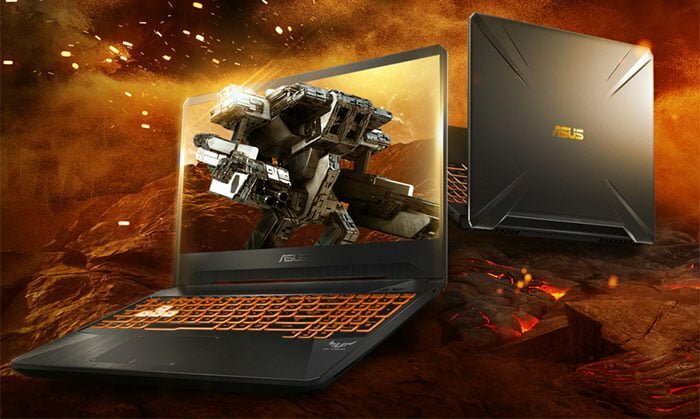 According to the 3DMark test data, the TUF Gaming FX505DU laptop will be equipped with the standard version of this graphics accelerator, while the ROG GU502DU model will receive a slightly cut-down version of the Max-Q frequency. This is due to the fact that the laptop ROG GU502DU, most likely, will be made in a slim package, because this is how the actual ROG GU501 is made. And, perhaps, it will be one of the first thin gaming notebooks based on AMD Ryzen. Note that AMD 3000 series mobile processors also have integrated graphics. In the case of Ryzen 5 3550H, this will be a Vega 8 GPU with 512 stream processors and up to 1200 MHz. In turn, Ryzen 7 3750H will offer Vega 11 graphics with 704 stream processors and frequencies up to 1,400 MHz. As a result, future users of the described ASUS laptops will be able to choose more economical integrated graphics for everyday tasks, and more powerful discrete GPUs for games and “hard” tasks. At the end, we add that according to the source, ASUS is also preparing a more powerful ROG GU502DV laptop based on the Ryzen 7 3750H processor and the discrete GeForce RTX 2060 video card. Zorain is co-founder of TechLapse. Based in Pakistan, Zorain is currently studying Business Management and aims to achieve the title of Chartered Accountant. Zorain loves writing about various technology news.